Coldest air pushed off South by warmer “uppers” from the North! 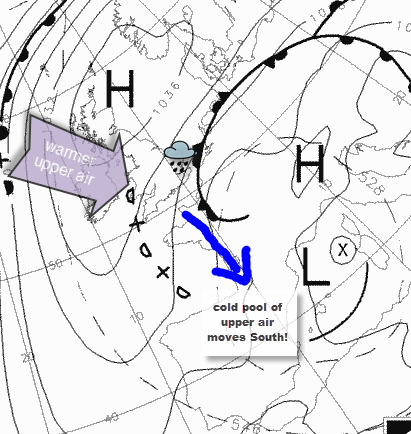 The very cold upper atmospheric pool of air which put Reigate in the freezer this half term (-11ºC at 1500m, -35ºC at 5000m!) is moving off South… to be replaced by warmer air aloft moving in from the North (-1°C at 1500, -25ºC at 5000m). Watch the video below to see the warm air moving in from the north and pushing the cold air south. This is rather upside-down to what we would normally expect and is being caused by warm air being squeezed through by an active jetstream in the Atlantic: this is feeding warmer air into the HIGH pressure sitting atop the UK currently. Reigate weather will be dominated by the HIGH pressure during this week making things mostly dry but, as we are located on the edge of the high pressure weak fronts will be able to influence our weather as they nudge across the Channel early in the week and bring light snow turning to drizzle through Monday and maybe more light rain on Tuesday. Temperatures remain uninspiring at 5°C.